Home/Uncategorized/How to Get Rid of Dandruff – 6 Natural Remedies! 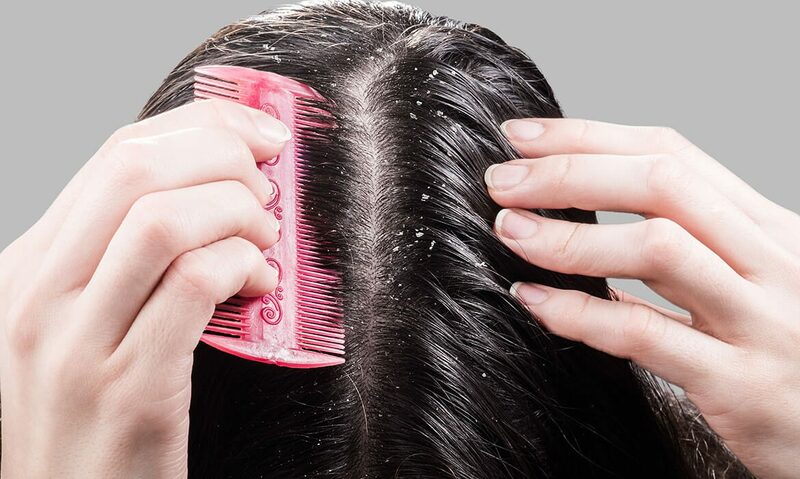 Dandruff is a skin condition that affects around 50% of the population. Oftentimes, it is difficult to get to the root of the problem since there may be more than one factor triggering or aggravating the situation. One of the most common causes of dandruff is dry skin! Cold, arid winter months are usually to blame for causing dry scalp. Though having a dry scalp is non-threatening to your health, it can be itchy and become irritated from excessive scratching. Yes, oily skin can contribute to dandruff. Seborrheic dermatitis is an inflammatory skin condition where the sebaceous glands produce too much sebum. This skin condition is characterized by rough, scaly patches, dandruff, itching & redness. A yeast-like fungus called Malassezia, is an organism that thrives on lipids. That’s why you’ll find this fungus present in areas of your body where you produce sebum; for example, your scalp! While this organism is normally present on the surface of your skin, oily skin can trigger an an overgrowth. Eczema and psoriasis are two other skin conditions that have been linked to dandruff. Both of these conditions produce dry skin flakes. You may be surprised to hear this, but some hair care products contain chemicals that can irritate your skin and exacerbate dandruff! You may be sensitive or allergic to certain ingredients, so it’s best to read the labels when purchasing any hair care products! Preservatives such as parabens and foaming agents such as SLS can be the culprit of your flakey scalp! Use: Just add a few drops of tea tree oil to your shampoo and wash your hair as you would normally. Tea tree oil’s antifungal properties are very effective at treating seborrheic dermatitis. Use: Mix equal parts apple cider vinegar and water into a spray bottle. Spritz all over your scalp. Cover your head with a towel and let it sit for 15-20 minutes. Wash your hair following this treatment. Repeat twice per week until your dandruff is gone. Apple cider vinegar restores normal PH levels on your scalp and makes it difficult for fungus to grow. Use: Massage 3 or 4 tablespoons of coconut oil into your scalp. Let it soak into your skin for about one hour. Then wash your hair thoroughly. Coconut oil is a great way to moisturize your dry scalp and its antifungal properties will keep the dandruff at bay! Mix these 3 ingredients together and apply the mixture to your scalp. Leave the mask in your hair for about 20 minutes. Wash your hair afterwards. The honey in this mask is very healing. Its anti-inflammatory properties will help soothe your skin and its antifungal properties will rid your scalp of the stubborn dandruff! Use: Simply add crushed garlic to a few tablespoons of honey and massage into your scalp prior to washing your hair! Garlic is a well-known antifungal agent that will work hard to kill off fungal overgrowth on your scalp. Garlic also contains salicylic acid, an active ingredient found in many dandruff shampoos on the market today. Salicylic acid works by softening dead skin and exfoliating your scalp. Use: You can obtain probiotics by incorporating foods that contain live bacteria (such as yoghurt, kefir, sauerkraut, miso, kimchi, and kombucha) into your diet. Improving gut health can help resolve chronic inflammatory skin conditions and inhibit the overgrowth of dandruff-causing fungus (Malassezia).